A wisdom tooth is actually just your third molar tooth. They received the name ‘wisdom teeth’ because they start to grow during the so-called ‘Age of Wisdom’: when someone moves from a child to an adult. Because these are the last teeth to enter our mouths, there is less space for them and this commonly causes problems when they try to come through in the late teens or early 20’s. Often as a result of the lack of space, they don’t come through in-line and often become impacted- wisdom teeth come with their own set of challenges and considerations! They are also the most commonly missing tooth and the tooth that often needs removing- for one reason or another. The reason that wisdom teeth give problems is down to the lack of space for them in your jaws. As the jaws move back they start to curve upwards behind the second molars and this can cause the wisdom teeth to become tilted or impacted. They may never come through, come only partially through the gum, come through out of position or don’t grow at all. Add this range of presentations to the fact they are right at the back of your mouth- the hardest tooth-area to keep clean, and it isn’t hard to see why they cause so many problems. 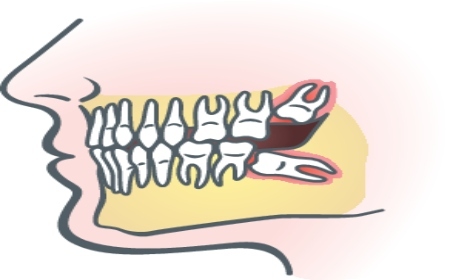 Impacted lower wisdom teeth affect about 75% of 20-30 year olds and this is why we end up taking so many of them out. If yours happen to grow perfectly in line or don’t grow at all you’re pretty lucky! When teeth become impacted, they are more likely to cause problems with cleaning and food traps; they may get infected, cysts can form and they can cause damage to the your other teeth. How do we treat wisdom teeth? Since the teeth are so far back, our options for treatment become somewhat limited. If you were to get a cavity, the tooth being useful and accessible, we would do a filling. If the decay had progressed deeper into the tooth, given how hard they are to treat and keep clean, it would be a far better option in most cases just to extract your wisdom tooth. We rarely do root canal treatment on wisdom teeth because there simply isn’t sufficient space for us to use our instruments. If the gum over lying the wisdom tooth becomes infected, we’ll treat this with antibiotics and cleaning… to get you out of pain and then discuss the removal of your wisdom teeth… depending on whether the teeth will ever be useful, are likely to cause further problems or may have a risk of complications. Why have I got pain with my wisdom teeth? What do the signs and symptoms mean? There are a number of common complaints that we see with wisdom teeth, but like any tooth, it can get decay, sensitivity, gum disease, wear or crack. Ache or pressure- bear in mind that it’s normal for you to feel some discomfort/sensation when the wisdom teeth are beginning to grow, move or are starting to come through the gum… just as a child would experience during their ‘teething’ process. It will often occur for short periods at a time and then go away, at least until the wisdom teeth are fully erupted in the correct position, or rest in a ‘less than ideal’ but balanced position. Unfortunately ‘more’ may be going on, unless, of course, you see a dentist and get them rule out other issues… it maybe that you are getting food packed in-between the wisdom tooth and the tooth next door- this would also cause an ache and may be an indication of decay. Pericoronitis- this is a severe pain associated with an infection under the gum of a partially erupted tooth. Food and bacteria build up and eventually and abscess forms. If the muscles surrounding the jaw become affected by pressure from infection or swelling, it can severely limit your ability to open your mouth – antibiotics will most likely be needed. If this happens more that once the wisdom tooth should be removed. Pain on biting- this can come from the top wisdom tooth biting on the gum which overlies the bottom one, or because, one or both of the teeth on that side are out of position and therefore cutting into the cheek and causing an ulcer. Nerve pain- food easily gets traps at the back of the mouth- between the second molar and the wisdom tooth- and can be very tricky to clean. 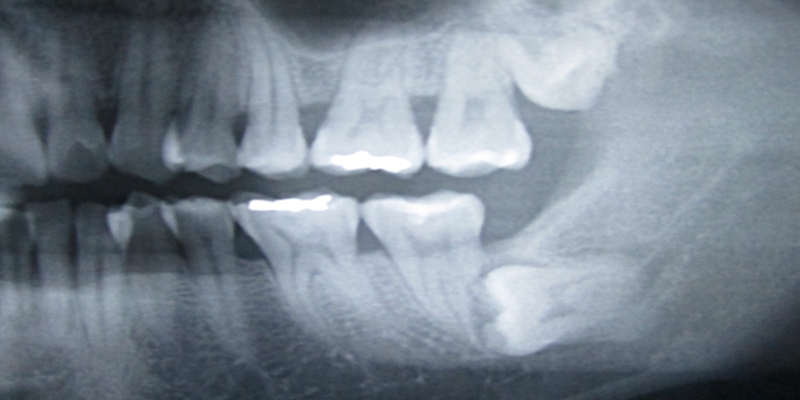 Over time this can cause a cavity which will continue to progress unless it’s picked up on x-ray or by your dentist. It can often causes a cavity in both teeth, so be aware of any early signs of this happening – once you start getting toothache and nerve pain it can be too late…you will need the wisdom tooth extracted and ‘hopefully’ just a filling in the other tooth… though it can end up being a root canal; sometimes the other tooth isn’t even saveable. Pushing/cutting the cheek- often upper wisdom teeth get pushed out of position at the back due to the lack of space and when this happens they can dig into the cheek as you open, or as you chew…once ulcerated this can be very sore. Crowding of teeth- there is a common theme that wisdom teeth cause all your other teeth to bunch up, particularly the lower teeth, but the evidence for this is somewhat lacking. Naturally overtime your teeth drift forward and may start to over- lap…you can prevent even the risk of this happening by wearing retention or retainers and having your wisdom teeth removed. Are wisdom teeth always painful? No, they are just another tooth and sometimes erupt normally without any complications. Wisdom teeth can get painful when they haven’t erupted all the way through the gum, grow at an angle, get decay in them or the gum over lying them gets infected. If you notice any pain, aching, discomfort or any gum irritation in that area you need to see a dentist as soon as possible. You should be seeing Dr Jamie regularly for your 6-month check- up and so when the wisdom teeth do start to put in an appearance, he can monitor them and advise you on the best course of action. This can avoid all sorts of pain and problems down the track. The good news is once they are out, they’re out and they won’t grow back! If you are putting off going and getting them checked out, don’t delay… the more infected, broken down wisdom teeth are, the harder and more complicated they are to remove. Who should extract my wisdom tooth? Dr Jamie takes out a lot of his own wisdom teeth, but will refer you to an oral surgeon: if the case is particularly tricky, if your medical history is complicated or if you require a general anaesthetic and hospitalisation in order to have all four removed at once. How do I know whether I have wisdom teeth and if they’re erupting in a correct position? Well, your wisdom tooth is your third molar so if you can count 3 molars then you have your wisdom teeth through. If you can see part of a tooth at the back of your mouth, then you know you have them, but only your dentist will be able to tell you their position and what should be done with them. A visit to your Maroubra dentist, will quickly determine whether you have wisdom teeth and if they’re erupting properly and how they’re are lying. An X ray called an OPG is almost always required- CT can also be used and is very useful for determining the relationship to other important structures in your mouth, especially if you’re intend to have them extracted. The growth of the wisdom teeth will be monitored and advice given on what best to do with them. It’s generally pretty obvious early on if they are likely to be useful or cause problems. How do I know whether I need to have my wisdom teeth extracted? Are the teeth going to be useful to you? Are they likely to cause problems themselves or with other teeth nearby? These are the questions that must be answered. If you get infections and swelling, or persistent pain that won’t go away with home treatments, then come and see us in Maroubra- we will look after you. There are also instances, where your dentist believes that your wisdom teeth will cause you problems in the future and actually recommend pulling out your wisdom teeth …even though they are not currently causing you pain! As a general rule it’s better to extract wisdom teeth, if possible under the age of 25, for a few reasons: the wisdom teeth’s roots are still not completely developed making it easier; the bone is more spongy and young people generally have a faster recovery and healing time with less complications. What are the risks and potential complications of having your wisdom teeth out? Dr Jamie will discuss both the benefits and risks of wisdom tooth removal at your consultation. He will need to take an x-ray to see how many roots there are, how much bone and the thickness of the bone, the type of impaction -if there is one- and the proximity to other vital structures. The risks of extractions all apply and you can read them in the dental extraction guide. The more impacted your wisdom tooth, and the more bone removal required, then the greater side effects, potential complications and the longer recovery will take. The biggest risk and the issue that the dentist will always warn you about, is the possibility of damage to the nerves that supply sensation to your lower teeth, tongue, lip and chin… the ones that go numb when you have a dental block. Whilst incidences of damage are very rare, some temporary loss of sensation can occur, often coming back over the course of a few weeks…. very rarely does permanent damage occur. The risk of dry socket is more in 1-35% of lower wisdom teeth cases, though it will depend on the case, the technique used, and how good you are with following the post -op instructions! With surgical extractions, you should expect, pain, swelling, bruising, difficulty opening and you may need time off work and follow a soft diet for a short while. Simple upper wisdom tooth extraction can be heal up really well, and you can be back to normal in a couple of days. Of course, there ‘s no saying exactly how sore the healing will or won’t be… every procedure and person is different. Please download are pre-treatment guide to wisdom teeth extractions for all the information. Looking after your mouth after a wisdom tooth extraction is really just like any other extraction, though severely impacted wisdom teeth removed surgically may cause more considerable swelling and require additional pain medication. There may be additional considerations: say if you needed a general anaesthetic… but everything is aimed at getting a good healthy blood clot to form so that healing proceeds nice and quickly. What should I expect after having my wisdom tooth extracted? Your general healing time from the extraction depends on your general body’s capability to recover and how easy or complicated the surgery was…. you may experience some bleeding or oozing for the first 24 hours, this is a normal, and can be controlled by biting on gauze for 15 minutes at a time if required. Dr Jamie uses dissolvable stitches in general, but will always want to review your circumstances, just to see how you are healing up and getting on. Antibiotics may be prescribed if your medical history makes you more susceptible to infection. What should I do after having my wisdom teeth removed? • Avoid strenuous activity for 24 hours- no exercise or heavy lifting, just rest. • Don’t smoke for at least for 3 days- or a dry socket is more likely. • Don’t drink alcohol, as this opens up blood vessels for 24 hours- bleeding is more likely. • Maintain a soft diet until the anaesthesia has worn off or until you’re comfortable and able to eat more solid foods. • Don’t rinse on the day, just gently spit. • Start warm salt washes from the next day- rinse as often as you can (minimum 3 times/day). • Take painkillers such as ibuprofen or paracetamol. Dr Jamie will prescribe something stronger if need be. • Brush your other teeth as well as you can. • Call Dr Jamie if you have any concerns, questions or issues- you should find the general healing is one of gradual improvement and after a week there should be little/no pain- though the space will take time to fully heal.